The Portola has a long and unique history dating back to the late 1800s. Too often misidentified with neighboring districts, it has its own story to reveal. Originally settled by Jewish immigrants, the area evolved into a community populated by nurserymen and their families who grew much of the city's flowers. "The Road," as San Bruno Avenue was affectionately referred to by the locals, hosted businesses that included bakeries, grocery stores, pharmacies, and a theatre. In recent years, the Portola has undergone changes as community leaders have enacted programs to beautify the neighborhood and attract new businesses and families to this locale. 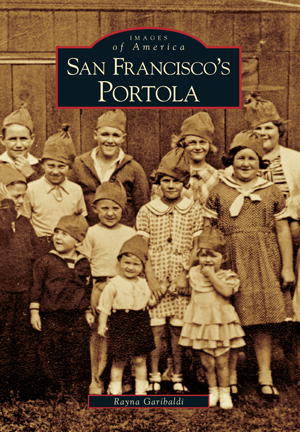 Lifelong Portola resident Rayna Garibaldi, whose grandfather was a founder of the University Mound Nursery, recounts here the history of this district through a collection of fascinating photographs dating to the neighborhood's early days. Many of the unique photographs in this book were garnered from the family archives of local business owners, nurserymen, and others who lived in the area. The long-lost photographs and histories presented in this collection have been shared by residents of the Portola to showcase the evolution of this changing yet still thriving community.